– Sweden is the largest market in CSAM’s expanding portfolio of customers, representing a key focus for the company in 2018 and beyond, said Rolf-Henry Grønlund, Chief Sales Officer. – Vitalis presented an important opportunity for us to demonstrate our products, including CSAM CIMA, to a wide-range of industry professionals. The Vitalis exhibition, which ran all three days of the conference, drew more than 5,000 attendees. CSAM had an impressive presence at the exhibition, with the only 2-storey booth, literally rising above all other exhibitors. The CSAM booth attracted approximately 1,800 visitors over the course of the event, with very positive feedback from attendees. CSAM employees were on hand to provide live demonstrations of the company’s key products. – It was an incredible pleasure meeting and chatting with so many attendees, said Linus Fred, Managing Director, CSAM Sweden. – We are inspired by the large number of visitors we had, and the interest in our new and leading products. The CSAM team also delivered a dose of fun, with a contest, giveaways, and green CSAM mocktails for visitors. 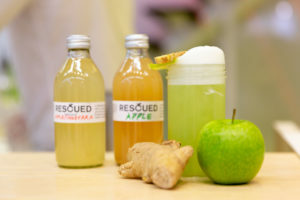 The drinks were a hit, with bartenders serving upwards of 2,000 mocktails! – We are so pleased with the turnout and the great performance of the CSAM team, Linus said. – Thank you to everyone who took the time to stop by the CSAM booth and thank you to our incredible employees who worked so hard to make this event a success. Several attendees remarked how refreshed and energized they felt after visiting the booth. – The combination of our leading products and talented employees is what makes CSAM the greatest eHealth company in the Nordics! Linus added. 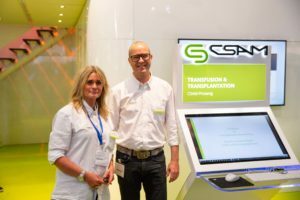 The launch of CSAM’s newest product, CSAM CIMA – the company’s first-ever clinical imaging mobile application, also garnered a lot of attention. CSAM was one of just a few companies selected to demonstrate their product at Demo@Vitalis, an event where new, ground-breaking products within Connected Health and eHealth are presented. Product Manager, Emma Angebrand, gave an excellent presentation of the CSAM CIMA app demonstrating how the solution simplifies and secures the process of capturing, using, and sending medical media via mobile technology. The full demo presentation can be viewed here, on CSAM’s YouTube channel. – We are excited by the interest in CSAM CIMA, both at Vitalis and in the broader marketplace, said Grønlund. – Product innovation is just one of the ways CSAM will continue to strengthen its position as the leading niche eHealth vendor in the Nordics. Vitalis was such a success for CSAM that the company is already planning on how to top their performance at the 2019 conference!